A sugar sifter of snow fell briefly over England this week and though a pretty sprinkling patchily remained on north facing slopes and in the lower reaches of valley sides, serious blanket covering never materialised. Clutching the well swathed and bubble wrapped altar frontal we took the train Ipsdenwards for an evening at the panto (and, on the following morning, a try on of the altar frontal). Generous hearted as ever, friends enveloped us in a seamless blanket of kindness. The panto’s writer swooped down from the hills to pick us up from the station and deliver us to another welcoming couple who not only fed us (a superb flakey pastry pie of gorgonzola, broccoli and tarragon), watered us (well wined us), whisked us off to the pantomime and provided the tickets but also set before us a comfortable and well dressed bed. Much hugging and kissing ensured at the panto. Pretty blissful! Thursday, the first in a run of four performances, is usually a bit of a slack night for the panto but this time the hall was half full of people nobody seemed to know – real paying customers, possibly only distantly related to performers – a good sign!. The other half was full of locals including at least one ex panto dame who had brought along a garrulous claque of fellow BBC Chorus singers clearly out for a good time and with the voices to prove it. As usual, the dames – two ugly sisters shoehorned into the wicked queen’s role in Snow White – stole the show; daytime jobs, one a builder and the other the vicar (my husband’s successor! ), were cast aside in the embrace of dramatic artifice. A chorus of children (future soloists in the making) appeared as soap suds, who cleaned the seven dwarves’ house before Snow White got the job (the script in true pantomime form is written around available talent); at half time, without a mutter of dissent, they were taken home to bed. As usual there was much forgetting of lines, ad libbing and audience participation; the director’s 4 month old baby blissfully slept through almost everything, whether in her own mother’s arms or, obligingly, someone else’s. Live music, a keyboard and a clarinet mostly managed to be louder than the audience. This, the panto’s 20th year, may be its last. There’s no shortage of actors but behind the scenes, the writers, directors, and the costumier are the same handful of people and several have said they would like to have a less stressful December and January next year – who could blame them? 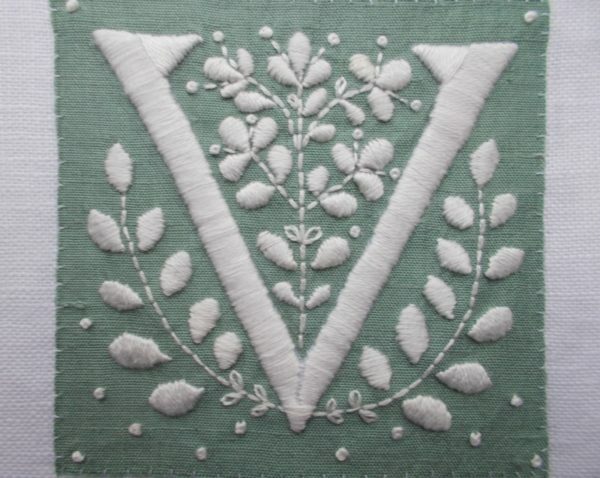 The embroidered V comes from a decorated letter found in an early printed Italian book on the history of Rome, titled Scriptores Historiae Augustae, from the Special Collections of the University of Glasgow and published by Philippus de Lavagnia in 1475. The letters were probably added to the text in the 15th or 16th century and are styled individually – many have exaggerated serifs, while others have none. 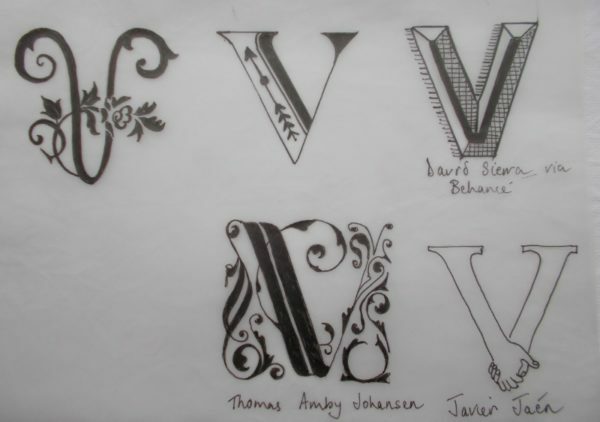 Some letters are plain, while others are decorated to a greater or lesser extent as the artist fancied. 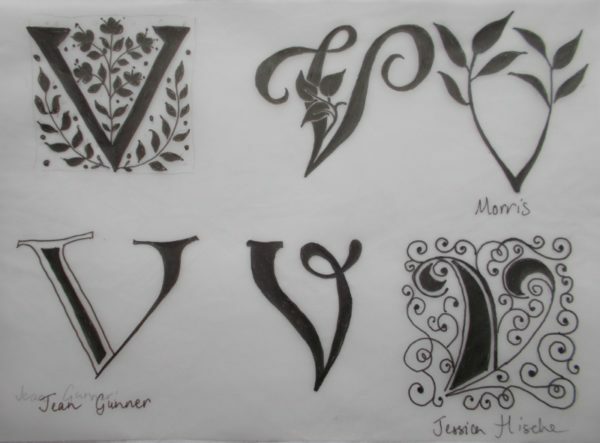 Most letters are enhanced by sprigs of flowers and once more these vary from being stylised to naturalistic, of a single colour to multicoloured. When floral inspiration fails, hexagons of honey combs, stars, dots, squiggles and baroque-like curlicues appear. All of the illuminated letters are on view at the University of Glasgow’s flickr set. This book is a great source of very clearly drawn exuberant letters with uncomplicated decoration in luscious colours, any of which would lend themselves well to embroidery. The book in its entirety must be stunning. 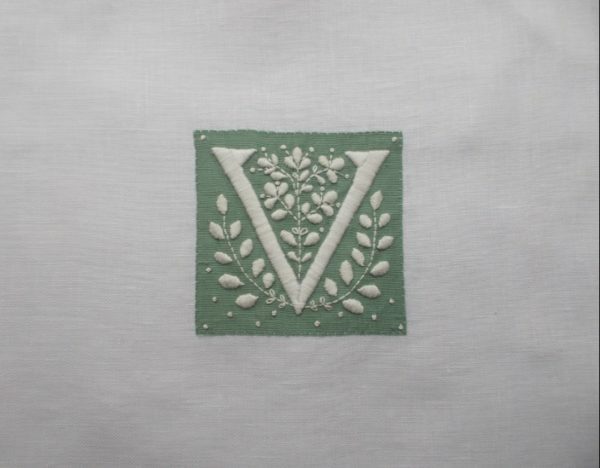 To translate the V into threads, I appliquéd a little square of silk on to linen using the last of what I think is Bondaweb. This sandwich of fabric provides a nice stable base for embroidery. The creamy white thread is Anchor No 2. Ipsden altar frontal: It fits! First try on of the completed patchwork. Now for the batting, backing and quilting. Joy oh joy, the altar frontal fits! The quilting will be no problem but meanwhile I shall be trying a new method of attaching the wadding and backing which doesn’t involve crawling over the carpet on all fours. Plastic drain pipes and pipe insulation will save my knees – I’ll keep the blog posted as to the success of this new technique but it’s got me rather excited! Coffee with the vicar and his twinkly wife at The Blue Tin Farm Shop followed by homemade soup in the vicarage enabled us to get to know a bit more about each other. The C of E is very bad about encouraging interaction between old and new vicars and, having obeyed the (sort of unspoken) rule of thumb that former incumbent shouldn’t visit the parish until 2 years have passed, we felt it the right time to get in touch. Although I had loved life in the vicarage (1990s, nothing special visually) and felt the view from our sitting room to be incomparably beautiful, I was pleased to discover that revisiting somewhere so dear to us did not wrench my heart beyond coping. (Although on the afternoon of our arrival the vicar, bless him, did find himself overcome by emotion and had to step outside for a few calming moments with his pipe.) Life moves on. There’s a wonderful selection of Vs there – so many possibilities! I think the C of E should trust its clergy a bit more. There are always a few difficult priests who perhaps don’t have the interest of the parish pre-eminent but most parish priests I’ve met fall over backwards not to cause problems. It’s also helpful for the incomer to have met and have a chat with the person they are replacing so that they can have a clearer image of their churchmanship and personality. Glad you like the Vs. Started thinking how limited just two lines and an acute angle can be and ended up being grateful for their simplicity. As Rachel said – so many lovely Vs. Very pleased to see the Ipsden frontal, it is beautiful. I can no longer crawl around basting quilts and this time I tried winding the layers one at a time on wooden poles. It worked but not perfectly. I suspect I’m going to encounter a few wrinkles, bumps and sags. Somewhat like the quilter. Interesting to hear about your using wooden poles. I thought I might try the plastic drain pipes covered with insulation idea but the outcome may be no better. 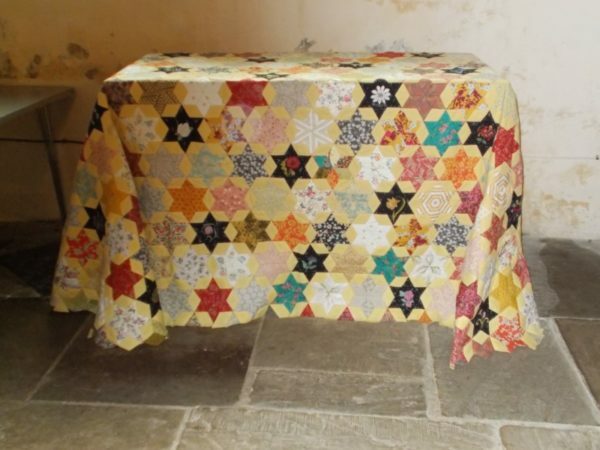 I’m slightly dreading it; for all that it’s a small table, the quilt is rather large. Am building up courage to begin!